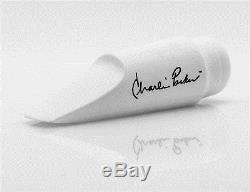 Charlie Parker Alto Saxophone Mouthpiece White resin Available Tip Openings. 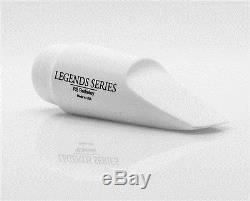 075 Legends Series mouthpieces are officially licensed mouthpiece reproductions modeled after the original mouthpieces used by the world's most iconic musicians. Production of the Legends Series line begins with and features 3D scanning and post processing services by Konica Minolta's 3D Scanning Labs, state of the art laboratory. Konica Minolta technicians capture highly precise scan data, capturing the unique characteristics of each original piece, thus matching the exact geometry of the original. Once the scan process is completed, the scan data is paired with highly specialized software to clean, align and create high quality CAD models. From an archival standpoint, Konica Minolta's 3D scan models of the mouthpieces are exact representations of the original. The entire process is overseen by RS Berkeley's master mouthpiece maker and designer, Jack Onque, who oversees every element of production from design to finishing to ensure the highest possible quality and accuracy of each authentic reproduction. The item "NEW CHARLIE PARKER LEGENDS SERIES ALTO SAXOPHONE MOUTHPIECE" is in sale since Thursday, February 04, 2016. This item is in the category "Musical Instruments & Gear\Wind & Woodwind\Band & Orchestral\Saxophones". The seller is "soundealz" and is located in Berkeley Heights, NJ. This item can be shipped to United States, to Canada, to United Kingdom, DK, RO, SK, BG, CZ, FI, HU, LV, LT, MT, EE, to Australia, GR, PT, CY, SI, to Japan, to China, SE, KR, ID, to Taiwan, ZA, TH, to Belgium, to France, to Hong Kong, to Ireland, to Netherlands, PL, to Spain, to Italy, to Germany, to Austria, RU, IL, to Mexico, to New Zealand, PH, SG, to Switzerland, NO, SA, UA, AE, QA, KW, BH, HR, MY, BR, CL, CO, CR, PA, TT, GT, HN, JM, AG, AW, BZ, DM, GD, KN, LC, MS, TC, BB, BD, BM, BN, BO, EC, EG, GF, GG, GI, GP, IS, JE, JO, KH, KY, LI, LK, LU, MC, MO, MQ, MV, NI, OM, PE, PK, PY, RE.